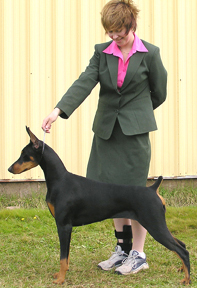 Charm was the first Dobe I ever handled. It was in Junior Handling. Thanks to handler Laurinda Parks for allowing me to use her. Reba is owned by Clarke & Brenda Johnson, and handled by Brenda. Congrats to all for Reba becoming the Top Dobe Puppy in 2004!